"Mobilegeddon" – this catchword has been buzzing around in the SEO scene since the beginning of 2015 and has struck fear into the hearts of many shop operators. The problem: If a website is not perfectly designed for mobile devices, it will slump to bottomless depths in the mobile search results. Already in 2015, mobile devices had a share of almost 30% of all page views in the whole of Europe and globally over 40%. The mobile update should reward mobile-optimised shops and give them an advantage compared with non-optimised websites and online shops. 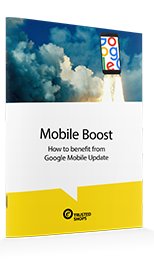 Download our whitepaper to know how your business can improve its mobile presence and benefit from Google's update.